Bring 2 cup of water and a generous pinch of salt to a boil. Stir in the quinoa. Cover and reduce to a simmer. Simmer for 18 minutes or until the quinoa has absorbed all of the water. Remove the lid and cover the pot with a clean dish towel. Place the lid back on the pot over the towel. Let the quinoa sit like this for 10 minutes. This allows the excess moisture to evaporate and be absorbed by the towel. It results in a fluffier and all around more delicious quinoa. While the quinoa is cooking combine the lemon juice, sesame oil, olive oil, mustard, soy sauce, garlic, and ginger in glass jar with a screw top lid. Screw on the lid an shake vigorously to combine. Set aside. 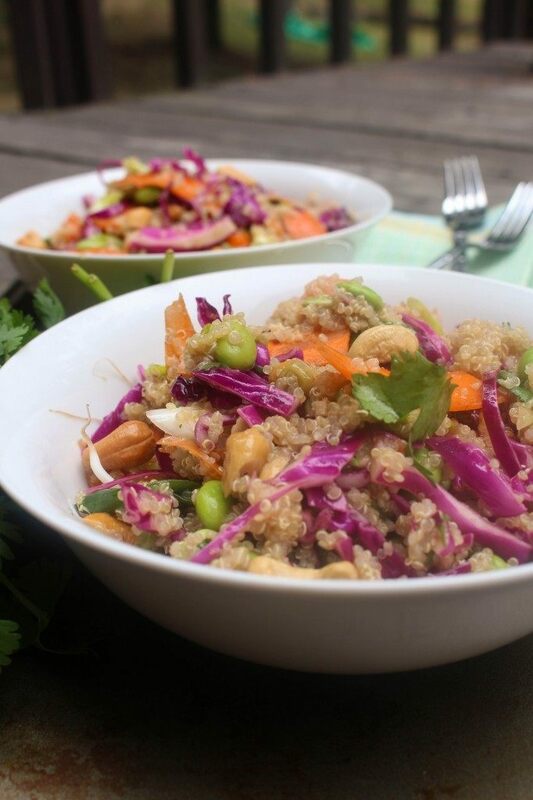 In a large bowl combine the edamame, carrots, purple cabbage, scallions, cilantro, and cashews. Add in the cooked quinoa. Toss the salad with all of the dressing. This salad can be served warm or chilled and stores well in the refrigerator.